For this topic I have no hesitation. I’ve read numerous biographies in my time and could list several that I really like but, of the ones I recall reasonably clearly (oh, for the memory of an elephant! 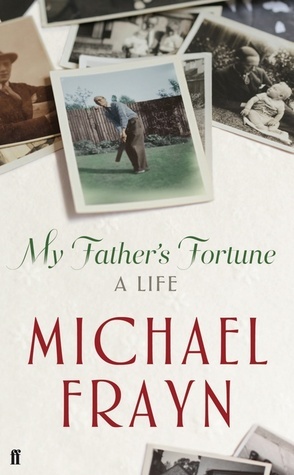 ), my favourite is My Father’s Fortune by Michael Frayn. There are several reasons why I like this book. It is the story of an ordinary man and it celebrates the heroism of the ordinary life. Frayn senior was born with no particular advantages: his family were not rich and the welfare state didn’t exist when he was young so he missed out on a lot of education and opportunities. Early he developed deafness which made his working life harder than it was for others. But he progressed in his career as salesman, provided for his family and educated his children to have more possibilities in their lives. Michael Frayn is a writer who can illuminate the ordinary to show its extra-ordinariness and its universality. In this case one of the universal themes is the relationship of father and son – all men have this relationship, even orphans experience it, but as an absence. Another is the value of keeping on even when the going is tough or, worse still, boring. On a more personal level, the book describes England as it was shortly before my own memories begin and gives me an idea of where my school and neighbourhood came from. Thank you for stopping by and commenting. I agree that everyone’s story would be interesting, but not everyone has a famous writer as a son. ‘My Father’s Fortune’ is beautifully written and this helps bring its subject to life. Joan Blackburn has written an autobiographical account of her childhood. “Granddad’s Rainbow” tells what life was like in England during the second world war. The first two chapters are on authonomy. It must cover much of the same time as My Father’s Fortune. Interesting that she’s chosen her grandfather. Her own emotional involvement must be different from Frayn’s – perhaps more distant and with more unknowns – I could be wrong but relationships with grandparents seem usually more relaxed than with parents. Thank you for the comment.